Last night the 2008 £5 app xmas special was held at The Werks. £5 app is a great local event which runs every 3 months where apps and side projects are demoed. For this special, the theme was games, or ‘interactive fun techie stuff”. For the first half of the event, former TV presenter Aleks Krotoski, now of Guardian Online, spoke about a text game she had developed. 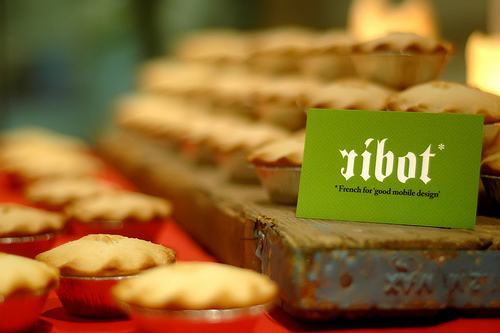 I couldn’t make the talk however, since myself and Jerome Ribot were out the back preparing the mulled wine as Ribot sponsored the event. As well as mulled wine, Antony brought along his ‘rustic plank’ and covered it with mince pies. Although the mince pie setup involved a certain amount of effort, what with the plank and all, the mulled wine was another thing altogether. For over 3 hours the camping stove was bubbling away and since we didn’t have a recipe we had to make it up as we went along based on a random selection of ingredients culled from a survey of local shopkeepers, baristas and publicans on great ‘secret ingredients’. 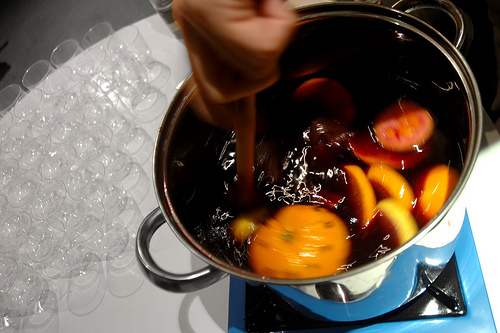 As I always say, the more secrets the better (when it comes to Mulled wine at least). For those of you lucky enough to catch a good batch at a good time, here’s the recipe! Throw all the fruit and spices in a saucepan, add the wine, heat gently for 10 mins, add the other stuff, keep heating. When the steam rises, serve. Don’t let it boil! At around the two hour mark, pop over the road for some more Ribena. Place the Ribena in the corner of the room. Ignore. Once everyone has had enough, call Raul over and ask him to man the saucepan, wait - there will come a point when he suddenly pours all the remaining Grand Marnier into the saucepan, that’s when your done! In all seriousness, big thanks to Raul for helping us out with the serving during the break and after the meet up. With Raul keeping an eye on things I did at least manage to catch the demos in the second half. First up was an amusing demo by Ben Rubinstein of Cogapp showing us people-pong, a webcam based game which uses face recognition software to place the panels of pong over your eyes when you look at the cam, enabling you to play pong by sliding from side to side. An interesting idea, shown below. Next up we had Emily Troop showing us the fantasic sumo robots - small robots on two wheels which use LED’s to either follow along a path of black sticky tape or stay within a ring of white tape and fight each other! Emily set up one robot as The Werks and the other as ‘rival’ co-working space, The Skiff. The Skiff was the clear winner, although for fear that life imitate science Skiff head honcho Jon was quick to state that they were merely inspired by The Werks, and not rivals. Russell and Richard from lastminute.com labs, the were next up demoing mobile phone games which take advantage of the accelerometer to create physical wii like games which turn the phones into, basically, wii controllers. We had sword fights with sound effects, light sabers and another version of pong. Great stuff. Finally Seb Lee-Deslie of Plugin Media demoed his Christmassy Flash creations over the years. This was lots of fun, with a demo of a classic Xmas game, interactive 3D snow and an audience participation piece where a web cam is pointed at a light, and snow appears to come out of it on the monitor. Finally we saw an Augmented Reality demo - basically, hold up a piece of paper with a symbol on it to a web cam, see an object appear in its place on the screen. [Try it here].